Why I recommend Anshika Art & Destination Jewellery to all the Jewelry lovers! …isn’t it? Jewelry is the best way to adorn and accentuate our beauty. It is always a delight to be updated with the latest in jewelry fashion. Who doesn’t love to sparkle an inch more by wearing innovative yet traditional pieces of Jewelry? Indian culture demands a lot of adornments. We are always loaded with occasions and celebrating them with the right piece of jewelry is what we need. Each jewelry that we wear during occasions speak and radiate a different story. Well, recently I was been invited to check out the latest collection by Anshika Art & Destination Jewellery at their Bandra Store. I am completely amazed and overwhelmed by the range that Anshika has to offer. It is founded by Mrs. Geeta Ghosh, Gemologist and Connoisseur of Fine Jewelry. Anshika aims at being the e-destination for our everyday and occasional accessory needs. It was a delight to meet the Owner and Creator of Anshika, Mrs. Geeta Ghosh who helped me check out the entire range. They have a number of options to select from- rings, bracelets, necklaces, handcuffs, bangles, earrings and more. Each piece is designed with utmost care and excellence and is impeccable and pristine. They have the entire range of jewelry in various foundations like stones, diamonds, Kundan work, beads, rhinestone and more. I have my wedding this year-end and it is exciting to know that I got an opportunity to check out Anshika prior to that, as now I am more relaxed about my jewelry shopping. They have an amazing collection for Bridal wear like Chokers, Rani Necklace, Kundan Work Necklaces and more. They also own an amazing range of collections in the Earrings Category which can brighten up any bride-to-be in the perfect light for their big day. Earrings are in types like Chandbali, Jhumkas, Kundan Work and they are beautiful enough to ditch the traditional necklace set and play it right with just wearing this simple piece of jewelry for various occasions. Mrs. Geeta was kind enough to gift me a beautiful piece of Chandbali in Champagne color for one of my Pre-Wedding Celebrations. It is beautiful, intricate and definitely an attention-grabber. 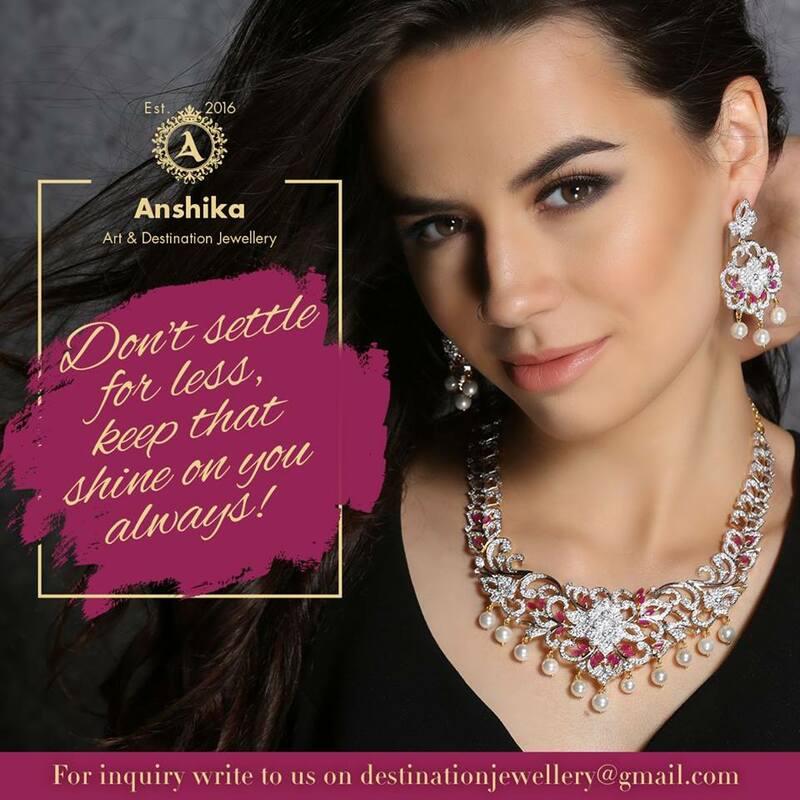 So, I completely and whole-heartedly recommend Anshika to all Jewelry lovers, because they have some really good designs to check out at reasonable and affordable prices. Each piece is made with perfection, efforts and has a divine shine to it. They are made with high-quality Cubic Zirconia and an irresistible shine. They have designer pieces for any occasion like daily wears to special celebration wears. You name it and they have it all. Are you a Jewelry Lover? What is your favorite pick in Jewelry? Do check out Anshika. You won’t regret it! Share your thoughts and ideas in the comment section. Stunning design of chokar, necklaces and most probably kundan work of jewelry. Great review. Love the collection from Anshika, are they available online? the collection looks great!! Would give them try. I can see why you would recommend them. Their collection is really gorgeous. Ooooh so pretty! I am currently loving chandbalis sooo much! I am a jewel lover and this brand and the jewellery look really awesome, beautiful and classy..
Jewellery looks beautiful. I think I should get some from anshika soon. Thanks for sharing the review. Every piece looks classy ans sassy. Definitely pick one for myself. I really loved the collection and your portrayal of ear-rings is awesome. Wow, this is such a beautiful jewelry collection. Are they available online?